At today's Kindle Fire HD unveiling, Jeff Bezos claimed the Fire HD will download content up to 40 percent faster than either the iPad or the Nexus 7. Neat trick. But how will it pull it off? With a little something called MIMO. Multiple Input/Multiple Output (MIMO) is the same technology that makes 4G and 802.11n so speedy. It could also be called More Than One Antenna In and Out. Most simply put, it increases the number of antennas at the transmitter and receiver. They work in concert to improve the device's performance by transferring more data without requiring added bandwidth or drawing additional power. A MIMO-enabled device does this by spreading the existing transmission power over multiple antennas, creating an array gain that can transmit more bits per cycle than a SISO (single input/single output) antenna. Essentially, a MIMO system widens the broadcast "pipeline," allowing more data to flow through at a time. Wi-fi routers have used this technology for years to streamline connections at home. ...without needing a faster processor to make it happen. In fact, it's a good way to make a device work faster at a lower price—adding an antenna is a relatively cheap parts upgrade compared to other components. 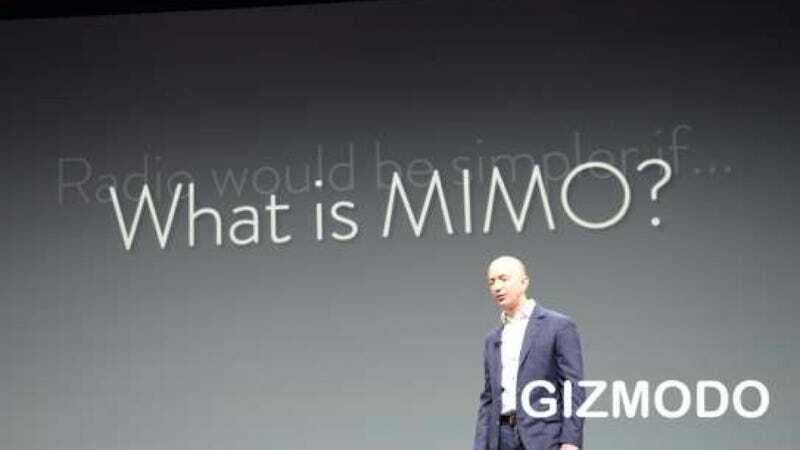 After a 2005 integration into the burgeoning 802.11n standard, MIMO can be found today in 4G, 3GPP Long Term Evolution, WiMAX, and HSPA+ systems. As Amazon noted today, it's not in the iPad or Nexus 7. But you'll find it soon enough in the Kindle Fire HD.